In ‘L’ is for Lookless, I introduce WPF’s lookless control model and examine what it means to style and template a control in WPF. I also talk about the importance of keeping the default Windows theme files on hand as a general reference for control styling and templating. Now that WPF 4 has officially released (as part of Microsoft .NET Framework 4.0), it is a good time to update your WPF theme files. The latest theme files can be downloaded here. Not a lot has changed in the templates of the existing controls… mostly just fixes (e.g., dynamic bindings to system colors for border strokes). The real benefit to the new theme files is that the updated styles demonstrate how to enable some of the new WPF 4 features (like ClearType text rendering and ScrollViewer panning in response to touch input). There are also a few new controls (DatePicker, DataGrid, etc) that have officially moved out of the WPF Toolkit on CodePlex and into the framework. The updated theme files provide a good reference for styling and templating these new controls. As we continue our series on ItemsControl, it probably makes sense to take a small detour and look at WPF controls in general. In this post, we will examine how WPF controls get their visual representation through styles and templates. Then we will look at how these techniques specifically apply to several ItemsControl classes. It is definitely worth taking your time to understand these concepts. Feel free to break the article up into more manageable pieces if you are time-constrained. I would also encourage you to keep kaxaml up and running as you learn about styles and templates. I think you’ll find that it makes the content more meaningful when you directly interact with the samples. As such, this article contains a lot of kaxamples, which is my term for kaxaml-ready samples. When you see the kaxaml symbol, you know you can cut and paste the included markup snippet directly into kaxaml to interact with it live. Then you are free to tweak the markup and make a few cool new styles and templates of your own! When developers first start learning WPF, they are often very surprised to learn that a WPF control does not include a hardcoded visual representation. Rather, the default visual representation is specified in XAML in a completely separate theme assembly from the class that implements the control’s logic. This separation of code-based logic from visual representation (the control’s look and feel) is what makes the WPF control model so powerful. We refer to this approach as a “lookless control model”. Why, you may be asking, is such a model better than the traditional approach of defining the visuals as part of the control? I’ll give you two big reasons: design and reusability. If you’ve studied WPF or Silverlight much, you have certainly heard about the new developer/designer workflow that these technologies enable. Namely, developers and designers can work side by side to simultaneously create powerful and visually stunning applications, with each person doing what they do best. A developer can implement an application’s logic at the same time that a designer creates the application’s look and feel. To a great degree, it is the lookless control model that enables this new workflow. By introducing a lookless control model where the visual representation of the control is specified apart from the control’s code, we are able to put the visual design into the hands of a qualified UX designer, where it belongs. The second big reason for separating a control’s visuals from its code implementation is reusability. In the past, if you wanted to have two buttons with different visual appearances, you had to create two separate button classes with the correct rendering code baked into each class. Both classes contained the same basic button logic. They both provided a “click” event in response to the appropriate mouse or keyboard user interactions. The only difference between the button classes was in the rendering logic. By moving the visual representation into XAML and out of the control class, we allow a single Button class to be reused wherever we need to support a Click interaction. The button can have whatever visual representation the designer wants to create. The developer no longer needs to be involved in the process of redefining a button’s visual representation. An example of this reusability can be seen in the following image (borrowed from my Observable Dictionary Sample) depicting a ListView in which each row contains a style name and a button. The only difference between each button is the “Style” used to define the button’s look and feel. In this case, a style is created for a Rectangle. There are two setters in the style. These set the Width and Height properties of the Rectangle to 50. There is a convention in WPF that an element’s type is used as its default style key. As mentioned earlier, if the Style property is not explicitly set on a framework element, a resource lookup takes place using this default style key (the element type) to find an appropriate style. Hence, in the example above, our style is applied to each Rectangle as a result of its default style key. We first introduced the concept of templates in ‘D’ is for DataTemplate. At that time, we learned that a template is just a tree of visual elements (along with some resources and triggers) used to define the look and feel of a member of the logical tree. 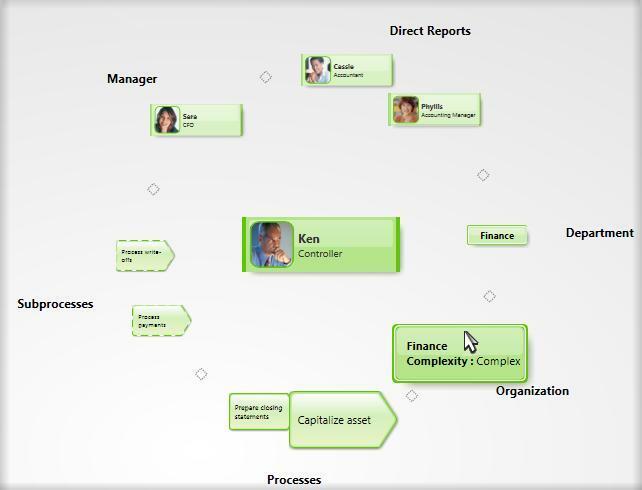 As it builds the logical tree, the framework watches for controls and data items that have corresponding templates. When such an element is encountered, the appropriate template is “inflated” into the actual visuals that represent the logical item and those visuals are inserted into the visual tree. We’ve already learned that a DataTemplate is used to declare the visual representation of a data item that appears within an application’s logical tree. In ‘P’ is for Panel, we learned that an ItemsPanelTemplate is used to declare the items host used within an ItemsControl. (Note that an ItemsPanelTemplate is a special template whose visual tree must consist of only a single Panel element.) In this section, we will look at a third type of template… a ControlTemplate. As the name implies, a ControlTemplate is used to declare the visual representation for a control. All native WPF controls have default control templates for each Windows theme. These templates give controls their default visual appearance. It should come as no surprise that the visual representation of a control like a Button is composed of several other WPF elements, including a ContentPresenter and an element to render the outer and inner lines that give the Button a 3-dimensional appearance. These subelements which make up the control’s appearance are part of its ControlTemplate. 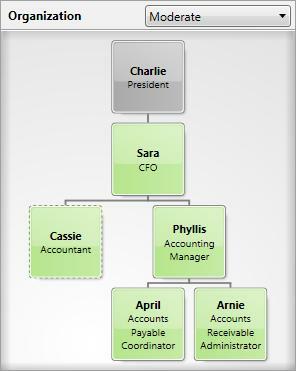 This template defines a visual tree for the ListBox that consists of a Border, a ScrollViewer, and an ItemsPresenter. The logic behind the ListBox is still defined within the ListBox class, but the appearance is defined by us. Note that similar to a style, the ControlTemplate class exposes a TargetType property. This property must always be set. If you ever notice your template is not being applied as expected, be sure to verify that the TargetType matches the control type. In the previous example, we assigned a ControlTemplate to a ListBox by setting the Template property directly on the ListBox. This is not the most common scenario, though. Styles and templates were designed to go hand-in-hand. As such, templates are very often included as part of a style. Clearly, we want our template and style to play nicely together. If we use a Setter in the style to set a property, we want the template to leverage that property. The problem in our example is that several property values (Background, BorderBrush, BorderThickness, Margin, etc) are hard coded on elements in our template. Other properties of the control are simply not bound to anything in the template. This clearly isn’t what we want. To fix these issues, we need to use something called a TemplateBinding within the template. Now all of the properties being set within the style are connected to elements within the template. Thus, those properties are truly reflected in the control’s visual representation. So far we’ve seen how to provide the look for a lookless control. Now let’s peek at the other half of the user experience… the feel. A control gets its look from the visuals. It gets its feel from how those visuals respond to state changes or user interactions. This is where triggers come into play. A trigger is a collection of Setter objects (or animation actions) that get applied only when a given condition is true. WPF contains three main types of triggers: Trigger (also referred to as a property trigger), DataTrigger, and EventTrigger. It’s also possible to respond to multiple simultaneous conditions by using the related MultiTrigger and MultiDataTrigger objects. As you might expect, moving the mouse over a Button that is using this style causes the opacity of the Button to change to 0.7. It also changes the inherited FontWeight value for any contained TextBlock elements to Bold. As the example above illustrates, triggers are fairly intuitive. You can pretty much understand how they work just by reading the markup. As such, we won’t spend too much time explaining their usage. Instead, we will just look at some tips and tricks for leveraging triggers in different scenarios. Now we have added a MultiDataTrigger with two conditions. 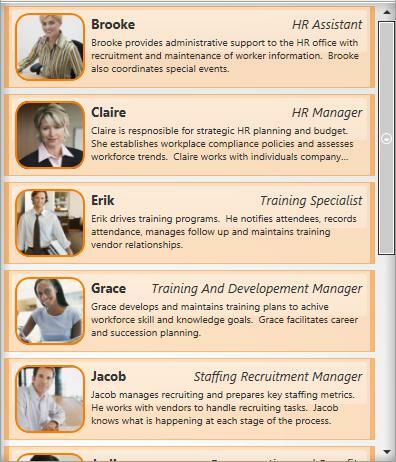 The first contains a Binding to a property on the data item that identifies the gender of the person. The second is the same binding we used earlier to get at the IsSelected property on the ancestor ListBoxItem. Now if the person is male and they are selected, the border will be blue. The above example illustrates another important aspect of triggers and setters… namely that the order of triggers and setters is important. When multiple triggers evaluate to true, all of their setters are applied. More specifically, they are applied sequentially in the order that the triggers appear within the Triggers collection and in the order that the setters appear within each trigger. Here’s a simple way to think about this… if multiple setters target the same property, the last setter wins! The final thing I will point out about this example is that it demonstrates how to combine both property triggers and data triggers by leveraging a MultiDataTrigger. At times, this can come in very handy. People tend to forget that a DataTrigger can always be used as a property trigger simply by setting the source of the binding appropriately. In this example, the event trigger is added directly to the Triggers collection of the framework element (the Button), itself. Again, the FrameworkElement.Triggers collection can only contain event triggers. If you wish to use property or data triggers, they must be within the Triggers collection of a style or template. Note that you cannot trigger off of a standard CLR event because the mechanism for supporting event triggers depends on the WPF event routing engine, which intelligently routes events to only the elements that have registered to receive them. With a property or data trigger, the condition that causes the trigger to be applied is based on state. As such, the condition will be true for a period of time. As long as the condition evaluates to true, the setters are applied to their target properties. When the condition later becomes false, the setters are no longer applied and the target properties fall back to their untriggered values. There is no such concept of state with an event trigger. An event is fleeting. The event fires and then it’s gone. Since the condition that invokes an event trigger is instantaneous, an EventTrigger does not contain a collection of setters. Rather, it contains actions which execute in response to the event. These actions allow you to control (start, stop, pause, resume, etc) the execution of storyboards. The example above uses a BeginStoryboard action in response to the FrameworkElement.Loaded event. <TextBlock x:Name="tb" Text="Toggle Me, Please!" Sidenote: This trick of using a discrete key frame animation to set a property value is actually a very useful thing to have in your arsenal… especially if you work a lot in Silverlight. Silverlight does not support property or data triggers. It does however support event triggers. As such, it is pretty common to use event triggers along with storyboards and discrete key frame animations in Silverlight to effectively set properties in response to events or visual state changes. In this example, when the TextBox becomes disabled, a dark background appears to slide shut over the control, letting the user know that they can no longer edit the control. When the control becomes enabled again, the dark background slides back out of the way. Since there is no event that fires on the TextBox when the control becomes disabled or enabled, we must instead leverage a property trigger’s EnterActions and ExitActions to begin the animations. Hopefully styles, templates, and triggers are starting to make a lot of sense. To really appreciate how this lookless model works, I would encourage you to spend some time looking at the styles and templates for the native WPF controls. All of the default control styles and templates are available in the theme files which ship as part of the Windows SDK or with Blend. When installing the SDK, you must select the option to install the .NET Framework 3.0 Samples. Then you will be able to access the theme files by looking in the Core directory within the following archive: %ProgramFiles%\Microsoft SDKs\Windows\v6.0 \Samples\WPFSamples.zip. The theme files also ship with Blend in the following directory: “%ProgramFiles%\Microsoft Expression\Blend <version>\SystemThemes”. If you have not installed the Windows SDK or Blend, you can still view the theme styles and templates using .NET Reflector with the BamlViewer Add-In. Simply reflect upon the theme assembly of your choice. For example, you could load the Aero theme assembly from “%ProgramFiles%\Reference Assemblies\Microsoft\Framework\v3.0\PresentationFramework.Aero”. Once loaded, select the assembly and then select “BAML Viewer” from the Tools menu. It’s worth noting that Blend also includes a set of “Simple Styles”, which are basically reference samples of how you might style and template the most common framework controls. These styles tend to be much simpler (hence the name) than the actual theme styles. See “Working with simple styles” in the Blend help file for more details. This is an ItemsControl series, so I guess we should spend a little time examining the lookless nature of a few ItemsControl classes. The remainder of this article covers several different aspects of ItemsControl templates. As with the rest of this series, many of these concepts also apply to non-ItemsControl classes. The early WPF (well, Avalon) platform contained an ItemsControl that never actually made it into any released bits. It was called RadioButtonList. As you can probably guess from the name, this was simply a list of mutually exclusive options, each one selectable via a RadioButton control. At first blush, this probably sounds like a really useful control to have in the platform, right? That’s what we all thought too. In fact we used it all over the place in demos and POCs. Then someone pointed out that the platform already contained a control for selecting an item from a list of mutually exclusive options… namely, a single-select ListBox! Doh! Clearly, if they were going to sell this lookless story, they needed to live by it, so soon thereafter, a breaking change email announced the removal of the RadioButtonList control. Each instance was replaced with a styled ListBox. The moral of the story is that the lookless concept requires a little getting used to. Clearly, even the architects of this new control model struggled a bit with it in the early days. <Window Title="RadioButtonList Sample" Width="500" Height="180"
Notice that I leverage the Tag property on the ListBox and a property trigger to toggle between a vertical and horizontal layout for the radio buttons. This is merely for convenience. If you want a more readable solution, you can always declare your own attached property of type Orientation to trigger off of in the style. We’ve already seen that a ListBox can take on many different looks. There is the default look, as determined by the theme’s ListBox style and template. Then there is the look we just defined above for a list of radio buttons. Just for fun, let’s review a few other styled ListBox examples. It should be clear by now that all of these different looks are enabled by this lookless control model which brings together the things covered in this article (styles, templates, and triggers) as well as several other concepts covered in previous articles, including item templates (‘D’ is for DataTemplate), container styles (‘I’ is for Item Container), and swappable items panels (‘P’ is for Panel). Wow! Since the control, itself, is lookless, we could essentially go on forever coming up with new looks for a ListBox. We are limited only by our imaginations and styling skills! There is one element that you will almost always find within the template of an ItemsControl. It is called an ItemsPresenter. In ‘P’ is for Panel, we learned that an ItemsPresenter reserves real estate within the control’s template for the items host (a.k.a., the items panel). By including this ItemsPresenter element within the control template and specifying the ItemsPanelTemplate separately, it is possible to have a swappable items panel without having to retemplate the entire ItemsControl. The ItemsPanelTemplate will be inflated within the ItemsPresenter to create a panel to host the items of the ItemsControl. Of course, as we also learned in ‘P’ is for Panel, it is not absolutely necessary to include an ItemsPresenter in the control template. Another approach is to simply include a panel in the template and set its IsItemsHost property to true. The drawback here is that the items panel is no longer swappable via the ItemsPanelTemplate property. In fact, ItemsPanelTemplate is completely disregarded in this scenario. I think its fine to derive custom ItemsControl classes like ToolBar that have special dependencies on known template elements. As a control developer, there are certain measures that you should take whenever you decide to go this route. First, you need to fully document the requirements of your control. By requiring specific elements in the template, you are reducing the lookless nature of your control. Designers will need to be aware of these limitations when they re-template your control. A ComboBox is a single-select ItemsControl whose full list of available items is usually presented in a “dropdown list” below a textual representation of the selected item. The template for a ComboBox consists of a TextBox and a Popup (as well as several other visual elements). As you might expect, the TextBox displays the selected item and the Popup contains the ItemsPresenter so it naturally presents the available items in the dropdown list. The ComboBox class contains certain logic that is very specific to the Popup control. Again, any such dependency on a known template element (also referred to as a “template part”) reduces the looklessness of the control, but that’s okay as long as the requirement for the part is well documented. This naturally raises a question as to how the ComboBox can accurately identify the known part (the Popup) within its template and hook it up to the control’s logic. One approach might be to walk the visual elements in the control’s template and look for an element of type Popup. Of course, this might fail if a designer decides to re-template the control in a way that involves two Popup elements. Note that although we’ve been looking at the ComboBox class in the above example, this convention of using known template parts is really applicable to all controls within the framework. Anytime a designer wishes to re-template a control, they should take some time to familiarize themself with the known parts. If they need to re-template a control for which they do not already have a sample template, they can leverage a tool like .NET Reflector to disassemble the control class and view the TemplatePart attributes. I’d like to offer some advice specifically for the authors of custom controls. A well-written, lookless control will provide what I refer to as a “loose” contract between the control and its template. This means that the control does not blow up (throw an exception) when elements are missing from its template. Rather, it knows how to degrade gracefully. This loose contract approach is used for the native ItemsControl classes in WPF. For example, you can re-template a ListBox and simply leave out its ItemsPresenter. The ListBox class never assumes that an items panel is present. As such, when you use your template, you will note that your app runs fine. Of course, no items are displayed within the ListBox because there is no items panel in which to present them. The important thing is that no exceptions are thrown either. The same graceful scale back can be seen in the ComboBox control when you leave out a known template part like “PART_Popup”. The ComboBox class never assumes that a Popup is present. Instead, the class always checks its internal Popup reference to make sure its non-null prior to accessing it. Testing your control against templates with missing elements is part of supporting a truly lookless control model. Users of your control will really appreciate your diligence in this matter because it means their designers will have full freedom to re- template the control as they see fit. We’ve already seen that the lookless model provides the opportunity to reuse a single control class with many different visual representations. There will certainly be times when you need more than just a new look and feel. If a class does not provide all the functionality you need, you may actually need to derive a new control by extending an existing class. The most common view used within a ListView is called a GridView. 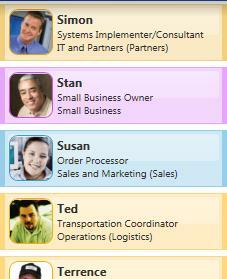 This view allows each item to be presented as a row within a grid (or table). The columns in the grid each have their own header. In simple scenarios, a ListView can be used as a lightweight data grid (which was important in the initial release of the platform because there was no native DataGrid class). You can see the ListView class in action in ‘R’ is for Rob has a Customer. Extending functionality is just one reason you might choose to derive a new control. Another reason might be that the existing control is not entirely lookless. In this case, you may wish to derive a new class and override specific functionality within the base class. 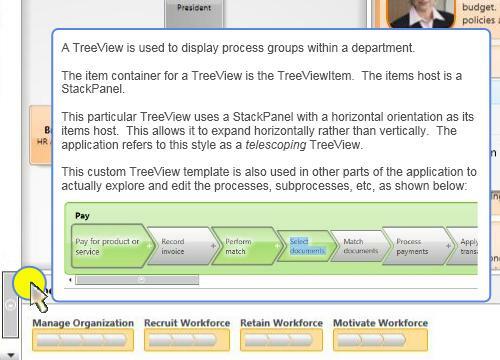 It turns out that creating this custom TreeView was not as simple as merely re-templating the TreeView class. The item container class, TreeViewItem, contains hardcoded support for keyboard navigation that assumes the tree expands vertically. (Pressing the Left and Right arrow keys on a TreeViewItem expands or collapses a branch in the tree, whereas pressing the Up and Down arrows navigates between nodes in the tree.) In order to create a horizontally expanding TreeView, it was necessary to swap the directional navigation keys. This required the derivation of a new TelescopingTreeView class from the native TreeView class as well as the derivation of a new TelescopingTreeViewItem class from the native TreeViewItem class. Hopefully this can be a lesson to us all. Clearly, this TelescopingTreeView required a lot more work than would have been necessary if a truly lookless base class existed. It would have been nice if the native TreeViewItem added support for keyboard navigation via attached key bindings rather than hardcoded keyboard behaviors. (Note to self: Do a post on attached key bindings someday.) I certainly try to keep things like this in mind whenever I’m overriding specific input methods like OnKeyDown(). Congratulations! You made it through the longest post in this series (thus far :P). More importantly, you are now familiar with the lookless control model and the techniques for defining the look and feel of controls within this model. In the next post, ‘N’ is for Natural User Interface, we will learn that an infinite loop is not always a bad thing! Robby has just fired this shot in The Great Templating War Debate of 2008. I don’t often disagree with Robby on platform issues, but… I am now compelled to reply with an opposing viewpoint on this issue. In my opinion, there are several problems with the templating model in Silverlight 2.0. I’m not going to focus on some of the more obvious ones (like the fact that WPF and Silverlight are using completely different models) because I think they have been covered quite well by others. Instead, I’m going to focus on what I consider to be the BIG problem… Silverlight’s templating model breaks the developer/designer workflow. The biggest value proposition for both Silverlight and WPF is the workflow that they enable between developers and designers. As a left-brained developer, you definitely do not want me involved in an application’s UI design. (Trust me on that!) The good news is that in WPF, you don’t need to worry. I can focus on the application’s functionality and the design work can be handled by a truly capable UX designer. You may reasonably be wondering, "What does application development and design have to do with control development and design?" Control development in WPF is very much just a microcosm of application development in WPF. I tend to write my application objects (user controls, windows, pages, the application itself) in the exact same manner as custom controls. This enables designers to create a UI that simply reflects the state of the application objects. If you think about it, this is a little M-V-VM pattern built right into WPF’s control and application models. To fully appreciate the workflow that this model enables for both designers and developers, you just need to experience it once… You turn over a really drab, form-looking UI to your designer and watch what they do with it… Wow! It’s an amazing feeling just to think that you had some part in the creation of such a thing of beauty! Back to the issue at hand… I happen to be very good at analyzing a control to determine the states that it will need to support. I’m also quite adept at implementing the functionality of a control and making sure that the functionality is exposed via the necessary methods and commands. Moreover, I’m very passionate about this type of control development. I think the designers I work with will validate that I always strive to provide them with all the hooks they could possibly want when it comes to styling and templating my controls. The term that WPF uses for this control model is "lookless". It basically means that the code for a control (or application) is written in a manner that makes no assumptions about the presentation layer. The control simply exposes state information via properties and events along with execution entry points via methods and commands. Silverlight’s templating model completely breaks this lookless control model. It requires that the developer meddle in areas where they don’t belong (such as looking for and executing storyboards in the UI layer). Furthermore, it takes away the ability of designers to think outside the box when they define UX interactions because they must conform to whatever hooks have been provided by (a.k.a., hardcoded into) the control. Or worse, it encourages designers to actually meddle in the control’s code where they don’t belong. The process of creating great controls will always involve designers and developers working together to meet each other’s needs. However, they each have their own strengths. As a developer, I DON’T WANT TO THINK ABOUT DESIGN! 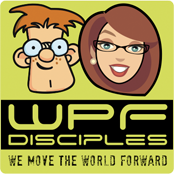 The reason I am so passionate about the WPF platform is that it frees me to do what I do best… write code. At the same time, it frees designers to do what they do best… create compelling user experiences by designing the look and feel of an application and its controls. This is all enabled by WPF’s styling and templating model. The arguments I keep hearing for the decisions being made with respect to Silverlight’s templating model all seem to revolve around toolability. Namely, applications like Blend need a more intuitive way to support styling and templating. My stance is that the architecture of the platform should not be driven by the needs of the tools. The platform should definitely accomodate those needs, but this can be done through helper classes. The platform’s architecture needs to be driven by decisions that best enable the next generation of killer software experiences. I fully believe these experiences can best be enabled using a truly lookless model. I also fully believe that this model enables the most ideal workflow between developers and designers. So how can Silverlight fix this? Simple. Give us property triggers, data triggers, and event triggers in both styles and templates. You are currently browsing the archives for the Control Templates category.